Paleontologists say this prehistoric dope was once the most dominated nitwit on the planet. MOAB, UT—U.S. paleontologists reportedly unearthed a nearly intact skeleton of a Spazosaurus Tuesday, an extraordinary discovery providing evidence indicating that the awkward, uncoordinated, and peculiar creature was the largest doofus to ever roam the earth. Preston Hopkins, the lead paleontologist at the excavation site, analyzed the fossilized remains and attributed the skeleton’s stooped posture, gangly neck, and misshapen skull with a significant overbite to that of a Spazosaurus. In addition, Hopkins said the discovery would yield a wealth of new information on the anatomy and behavior of the massive prehistoric dork. “Further examination of the limbs also supports the theory that the Spazosaurus was tremendously weak and nervously flailed about its withered arms like a total jackass,” added Hopkins. According to researchers, the 30-foot-tall, hunched-over Spazosaurus were bizarre, thick-headed outcasts, known for lacking basic social graces and dying in idiotic ways. The scholars confirmed that every single dinosaur in the Jurassic Period ostracized the accident-prone Spazosaurus, which was a close cousin to the constantly rejected Dipshitlodocus. The scientists reportedly found petrified footprint impressions suggesting that the earliest known dweeb was pushed away or shoved into tar pits by the other dinosaurs, confirming popular notions that the Spazosaurus was once the most dominated land-dwelling dingus. Calling the discovery a major breakthrough, the team of paleontologists found that stress on the Spazosaurus’ skeleton indicated that the mammoth dweeb was likely 12 tons overweight, with a large, repulsive gut balanced on spindly, out-of-shape legs. While studying the gigantic loser’s skull, the researchers established that the Spazosaurus was an omnivore by the substantial amount of fossilized meat and vegetation stuck between the extinct clod’s crooked teeth. 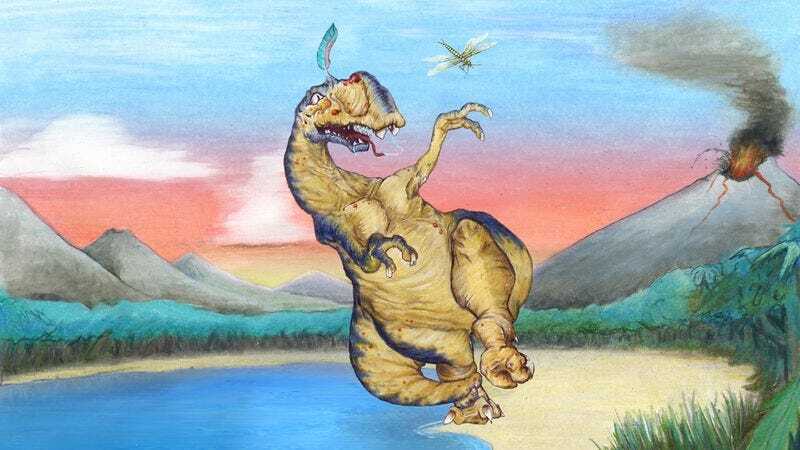 Brunner told reporters that researchers experienced a combination of fascination and contempt after discovering that the Spazosaurus had one really dumb-looking feather growing out of its head. At press time, the paleontologists said that the Spazosaurus skeleton provided an important link to better understanding modern doofuses such as the flamingo, platypus, and Bloomington, IN eighth grader Justin Hicks.